Travel to Chile offers adventure into the Andes Mountains, Patagonia, Easter Island and nearby Antarctica. But for those of us who would prefer to sit and sip, Chile is about wine, particularly its hearty reds. Chile's wine-producing valleys are developing their own vineyard tours -- like those offered in California but without hints of eliteness or pretension. Most wines in Chile, including some good vintages, are in the $5 to $15 range. Chile is a safe travel destination, some 16 years after the end of the dictatorship of the late Gen. Augusto Pinochet. He was blamed for thousands of political killings and torture. These days, though, most folks in Chile would prefer to talk about their cosmopolitan capital of Santiago, their growing exports and Michelle Bachelet, Chile's first woman president. Battles and bullies long have played major roles in this part of the world, and if you scratch the surface of respectability, you might find a fugitive wanted in the United States for selling bombs to Iraq. More about him later. An enjoyable way to get from Santiago to the rich vineyards of Colchagua Valley is aboard the antique rail cars of the Wine Train, known as the Tren del Vino. The all-day tour for $97 starts with a two-hour bus ride south from Santiago, then about two hours on a train with local wines to taste on board, followed by a tasting at a local winery, lunch in the somewhat dusty town of Santa Cruz (with more wine) and a visit to a museum of Chile's turbulent history. The bus back to Santiago is a peaceful snooze. A restored 1913 steam engine pulls the Tren del Vino. Since June 2004, it had missed only one day of its weekly Saturday runs into the valley. Alas, on a special Sunday excursion for a group of Americans last fall, the engine was steamless most of the day -- we were on board for less than 30 minutes -- so most of our valley visit was not on a wine train, but a wine bus. Still, the journey from Santiago into Colchagua Valley was delightful. The long, narrow valley, with mountains on both sides, follows the course of the Tinguiririca River, which flows from glacial peaks in the Andes to the Pacific Ocean. Windflowers were in full bloom in October, which is spring in the Southern Hemisphere. Our bus took us to the Bisquertt family winery, which dates back at least 100 years. Many of the wineries of Colchagua Valley are rustic places on dirt roads, but the Bisquertt operation is a modern winery surrounding a stately family house that is more than 100 years old. The original vines of Chile were carried into South America centuries ago by European missionaries. Conditions of land and temperature -- cool, frost-free nights -- are among the world's best for growing grapes. But most Chilean red wines became worthy of export less than a decade ago, our guide said, with the import of oak barrels from the United States and France. The result was a much better aging process. Harvest time in Chile is February to May. Most Bisquertt reds are to be drunk within two to five years, although 1998 was a special harvest at the winery, and the 98 Zeus (60 percent cabernet and 40 percent carmenere) still is at its height, fetching $50 to $60 a bottle. The winery wanted $60, but I found it for $50 in a wine store in Santiago. We sipped two Bisquertt wines that carry a Casa La Joya label. 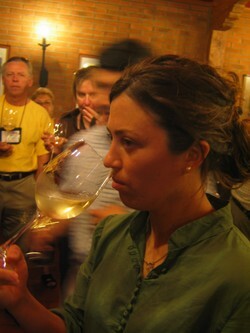 The first, a 2006 sauvignon blanc reserve, was a light yellow with a green tinge, medium bodied. Our group of tasters recognized passion fruit, asparagus and lime flavors. Oenophiles love to expound on sensory perceptions. The second was a 2004 carmenere reserve, with intense ruby color. We smelled red berries and spices, and the wine tasted of red berries. Both wines sell in Chile for less than $10, and our group rated them highly. The Bisquertt winery also is known for its velvety merlot. The Bisquertt winery has a website, www.bisquertt.cl. The Colchagua Valley wine website is www.rutadelvino.cl (click for English). Lunch was at the intimate Santa Cruz Plaza Hotel in the town of Santa Cruz, which is in the heart of the Colchagua Valley. The hotel has a Napa Valley, Calif., feel to it, with lots of red flowers and stone walkways through the green grounds. At lunch, more wine flowed, including a full-bodied cabernet by MontGras winery, a good buy in Chile for $6 to $8 a bottle. The Colchagua Museum next door is a private collection that offers an educational walk through the history of Chile, from the dinosaurs to the coming of the Spaniards and all the wars that followed. Armaments play a major role in the displays. The museum is well laid out. Displays are explained in Spanish, but local docents speak English. During the train ride before heading back to Santiago, waiters poured hearty red wines into small plastic cups as the Tren del Vino steamed tentatively across a wide glacial river, the snow-capped peaks of the Andes for a backdrop. I asked about the success of the train. A spokesman for Tren del Vino said the company is doing well and has hopes for expansion, including another restored steam engine. He said the operation was owned by a nonprofit company, but I was not able to ascertain whether the nonprofit part was on purpose or not. 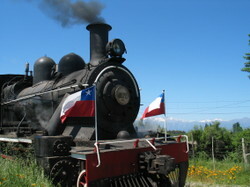 The weekly Wine Train tour leaves Santiago each Saturday morning. Tickets start at $97. Only later did I learn that most of our tour -- the Tren del Vino, the charming hotel in Santa Cruz and the museum with armaments -- is part of the empire of Chile's Carlos Cardoen. In U.S. news reports, Cardoen, 63, has acknowledged an arms-dealing past, which began in the 1980s when the United States sided with Iraq in its war with Iran. Cardoen, who holds a doctorate in metallurgical engineering from the University of Utah, still is under indictment for importing zirconium from the United States to Chile to make bombs. In a 2005 news report in the Miami Herald, Cardoen made no apologies for selling an estimated 29,000 cluster bombs to Saddam Hussein for more than $200 million. Now, the bomb maker turned winemaker is plotting to transform the Colchagua Valley into a profitable wine operation for all its landowners. Already, the valley has become a popular stop for international travelers, and low prices make Chile a good value for folks who like to taste wine. While it may be disconcerting to raise a glass of wine connected in any way to one of the world's old merchants of death, history continues to show that friends and enemies change -- and so do their products. These days, the bomb makers produce a fine cabernet. The writer: David Molyneaux is editor of www.TravelMavens.net. Santiago is served by numerous airlines. Molyneaux flew from Houston to Buenos Aires, Argentina, on Continental Airlines (www.continental.com). then to Santiago on LAN Chile (www.lan.com). For Chile trip planning, visit www.visit-chile.org.